On the tideless Great Lakes, there's not a lot of opportunity to experience a "drying harbour". In the Bay of Fundy, the UK and many other European harbours, it's a twice-daily event. While I understand how bilge keels work, the use of jackstands, tying to seawalls and the like, is there in fact a way for a fin or a full keeler to (short of gradually sinking in loose silt or mud) to moor or anchor in a drying harbour? Without tipping right over, I mean? I don't think all our British friends, for instance, favour bilge keelers, so there might be something I'm overlooking. Google's surprisingly unhelpful so far. It seems an obvious question, I know, but as so many harbours do dry out, if there isn't a functional answer, I and our full keeler will have to either anchor well out when weather allows, or bring some pretty impressive jackstands. Which isn't a bad idea for a number of maintenance reasons, but not something I'd like to do twice daily. Well, why do you think bilge keelers are not favored? Bilge keels are great in tidal waters like the English Channel. Go anywhere; dry out. Run aground, and just make a pot of tea and wait for the tide to come back up. They are quite popular in the UK. In France, they even make high performance bilge keelers with very high aspect keels. FWIW, once ran aground where the tidal range left me high and dry. Boat was a Morgan 35 fin keel centerboarder. I saw that we weren't going to get off till the tide came back in and the tide was probably going to leave us high and dry. Ran out the spinnaker halyard to one side with an anchor and another anchor to the other side with the jib halyard. Boat stayed upright, we had a bottle of wine and then went to bed to wake up to the boat afloat. If you don't have 'legs', it's a possible way to handle such a grounding a little less inconveniencing. You do have to a long enough keel that the boat will sit on the keel without tipping over forward. Hard to know if I have that long a keel without experimentation that could mess up my interior! Eyeballing it, yes...it's possible, but it's a full keeler, not a centerboard. As for bilge keelers, while I realize they are certainly appropriate for the task, only the later models seem to better balance (no pun intended) sailing performance with staying upright on damp bottoms. Last summer, I went aground in sand just leaving the quay (was 1 minute late and the tide was ebbing quickly). The boat was about 1' away from the quay wall. I don't have beaching legs yet, so I stacked fender boards and flat fenders (able to withstand the pressure) between the hull and the wall. Then before all water was gone, I heeled the boat toward the quay, to make sure she didn't go the other side. As an added precaution, I also tensioned a line between the mast and a steel ring on the quay. The keel is a fin but with a flat base, so I was sure it wouldn't go deep in the sand. Interesting thread, for me anyway. Last year I did an 'unintentional careening.' The Delaware Bay can have quite a bit of tide, say 7'. I put her on a bar at mid falling tide. The outgoing current pushed her up further. She eventually went right over to the point where the water was receding on the side, so she was down solid for sure. I was plenty worried we would not have enough tide to get her back off. But things worked out OK in the end, tide came in and she floated right off. Our boat, built in England, has some fittings for legs built into the hull, but I don't have legs for the boat. They would be pretty big items as we have nearly 7' draft and are reportedly at 44,000 lbs. Our keel is flat and long and 2' wide. So I too wonder how she will take to the bottom. While I understand how bilge keels work, the use of jackstands, tying to seawalls and the like, is there in fact a way for a fin or a full keeler to (short of gradually sinking in loose silt or mud) to moor or anchor in a drying harbour? Without tipping right over, I mean? Photos like that make me nervous, even as I commend your quick thinking! Yes, thanks. Actually, those legs might do the trick, at least as has been pointed out for a temporary "drying". 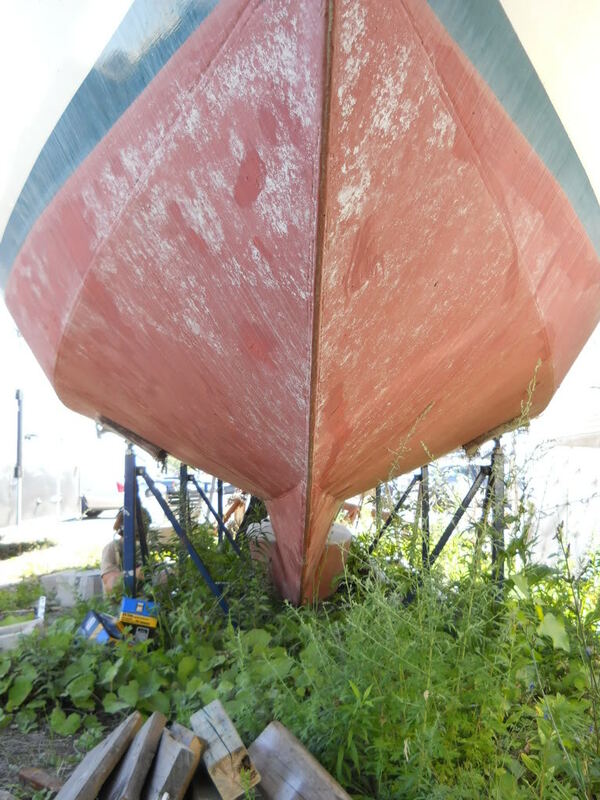 My keel's a little unusual, but certainly has about 25 feet x 18 inches of "foot". I've seen a few long oars being used for leaning the boat, but I am not inclined to try it!